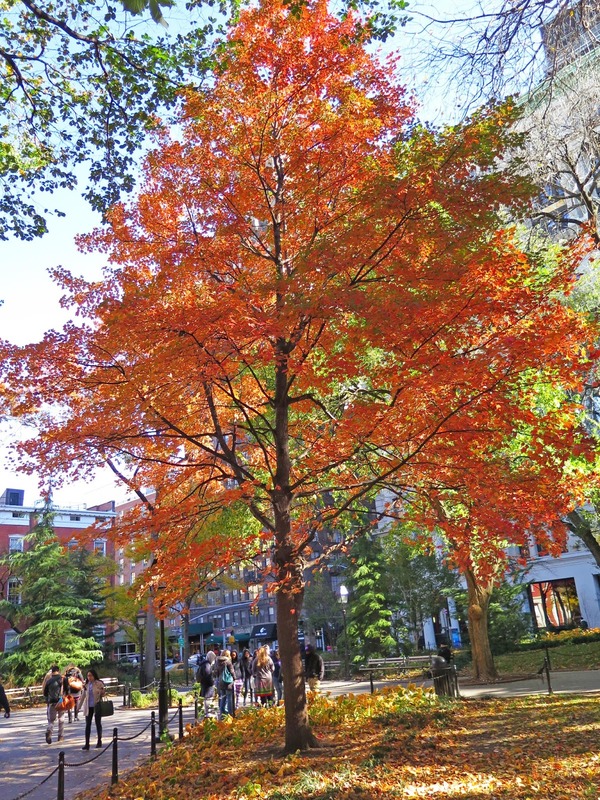 This guide is based on the Fall Foliage Tree Walk of Washington Square Park organized by WSP Ecology and led by Leslie Day, PhD on November 14, 2014. Unless otherwise noted, the tree photographs were taken by Hubert J. Steed from his Trees - Washington Square Park gallery and used with his permission. 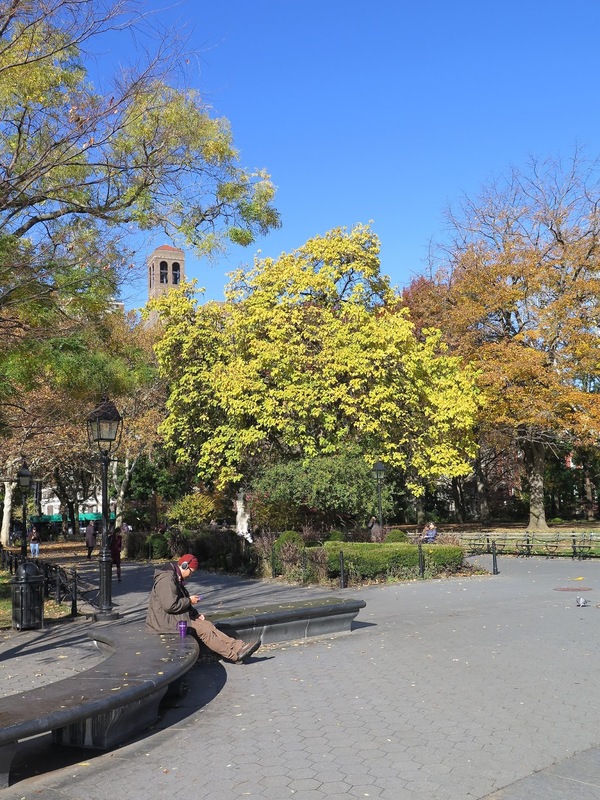 If you visit the Washington Square Park before the end of the month you may be able to use this guide, otherwise you'll have to wait until next fall. Also, Not every tree visited during the actual tour is recorded below. 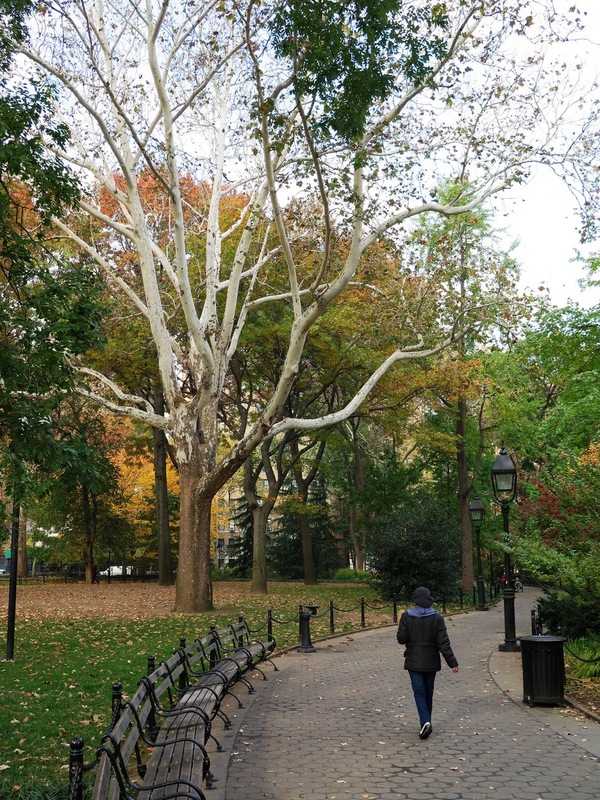 Begin your walk at the historic English elm at the northwest corner of the park. The tree is reportedly over 300 years old. Proceed east and look north along the path to a London plane. 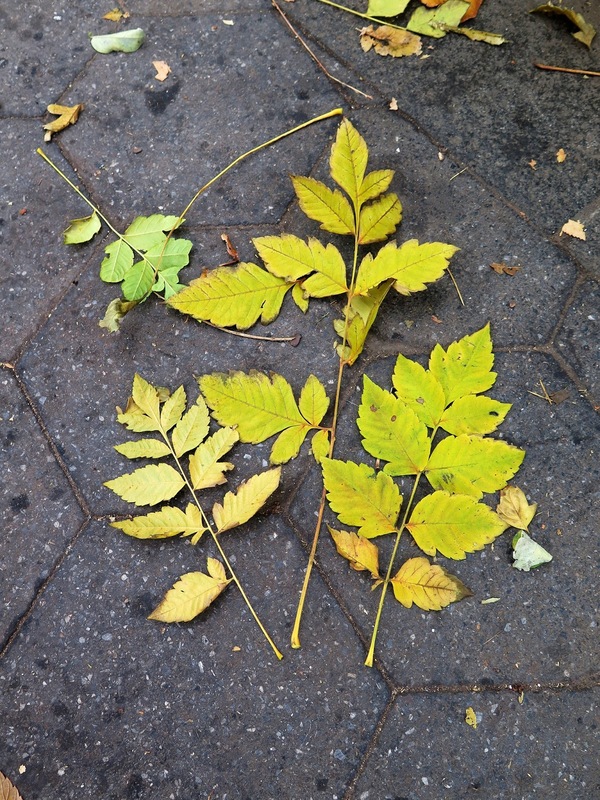 The species is the most common street tree in NYC and its leaf looks suspiciously like the NYC Parks logo. Walk further still for a type of white oak. It could be a swamp white oak or a swamp chestnut oak. Compare these two oaks here. The fall foliage of both species is russet. Look north for a mulberry. If the leaves are dull, it's a red mulberry; if they are shiny, then it's a white mulberry. Compare the species here. Look south for a very large American sycamore or Platanus occidentalis. 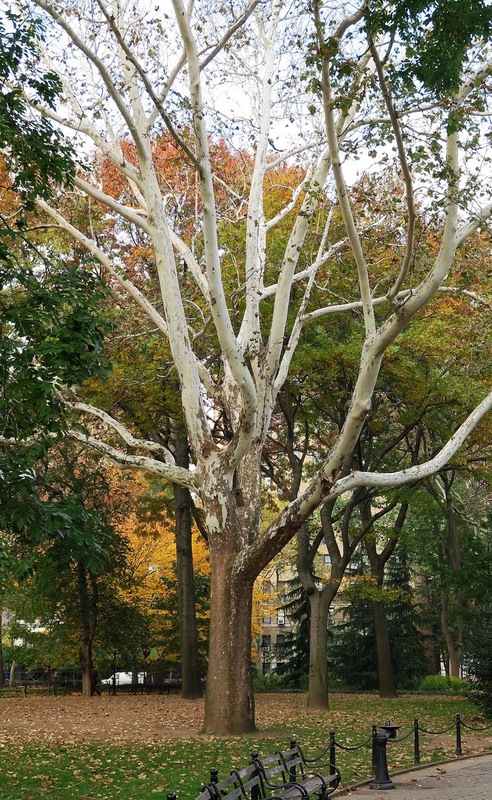 The American sycamore is one of the parents of the hybrid London plane; the other is the Oriental plane or Platanus orientalis. To the right of the playground's gate is a star magnolia. Walk behind the Arch and stop in front of the first grove of trees on your right (or southeast of the Arch). You will see (and possibly smell) a Ginkgo. 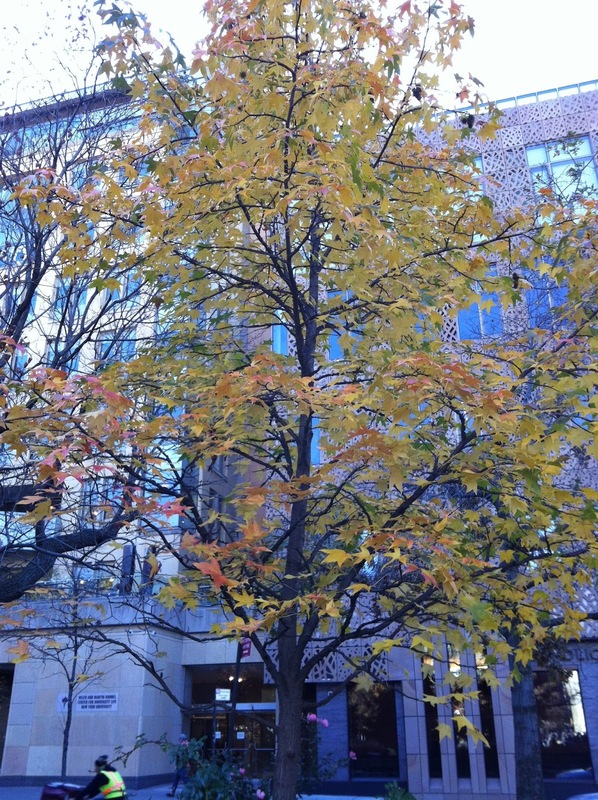 Just beyond the Ginkgo - and its vibrantly yellow fall foliage - are red oaks - a mix of Northern red and pin oaks. Continue on the path and turn right (or south) the next time you can. You should see a red maple. 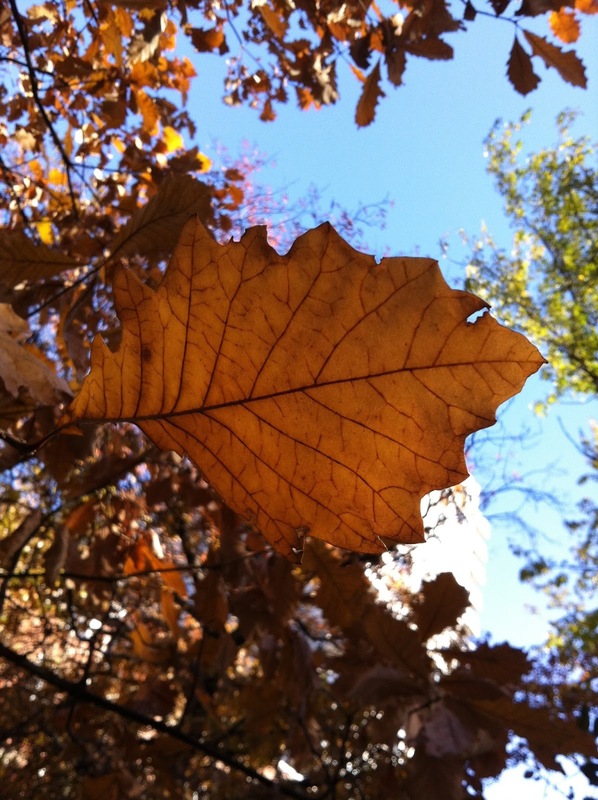 The fall foliage is red but so are the twigs, flowers, and samaras in their seasons. If you return to the main (outer) path, you should see a large tree growing in the middle of the path. 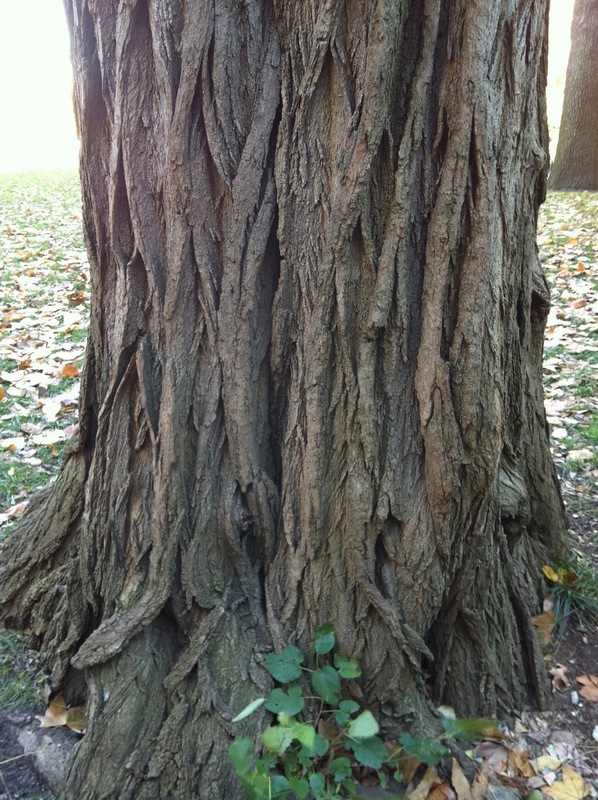 It is an Osage orange. Notice the burl on its trunk. Keep walking south and on your right you should notice several Sophoras (the new Latin name is Styphnolobium japonicum). 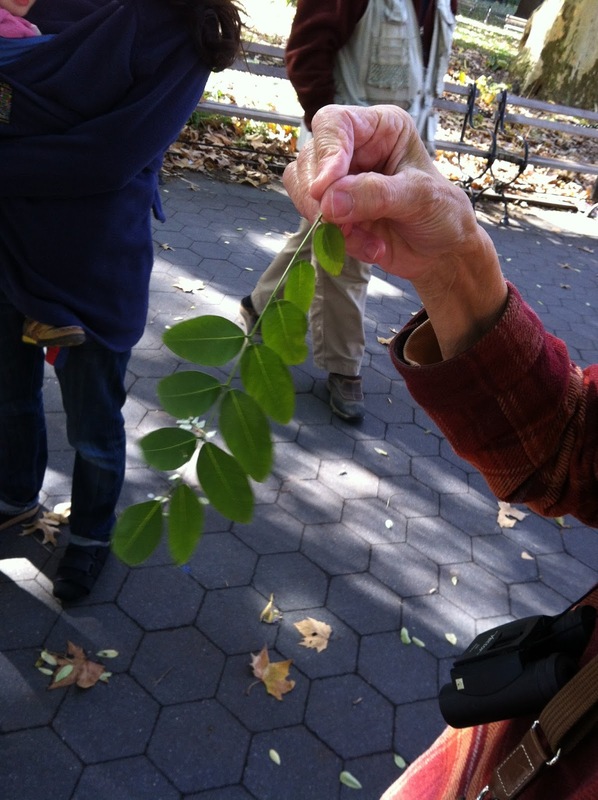 Observe the leaves - they are composed of leaflets. Turn around and you should see a goldenraintree. Notably are the dried, lantern-like seedpods. The fall foliage is yellow. 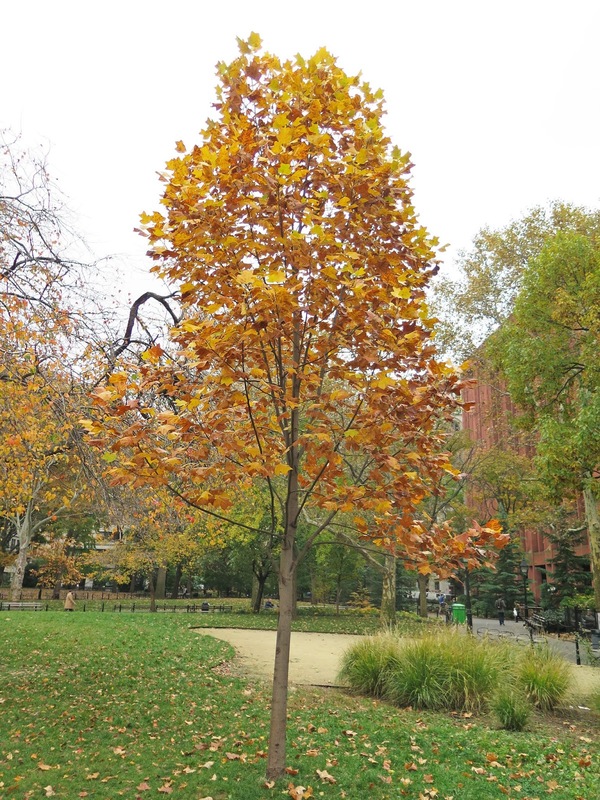 Walk past the LaGuardia Place entrance and the little dogs dog run and just before the Thompson Street entrance, face south to see a sweetgum. You may find its spiky fruit nearby. The fall colors are striking yellow, red, and purple. Turn right (north) then look east at two new tulip trees. 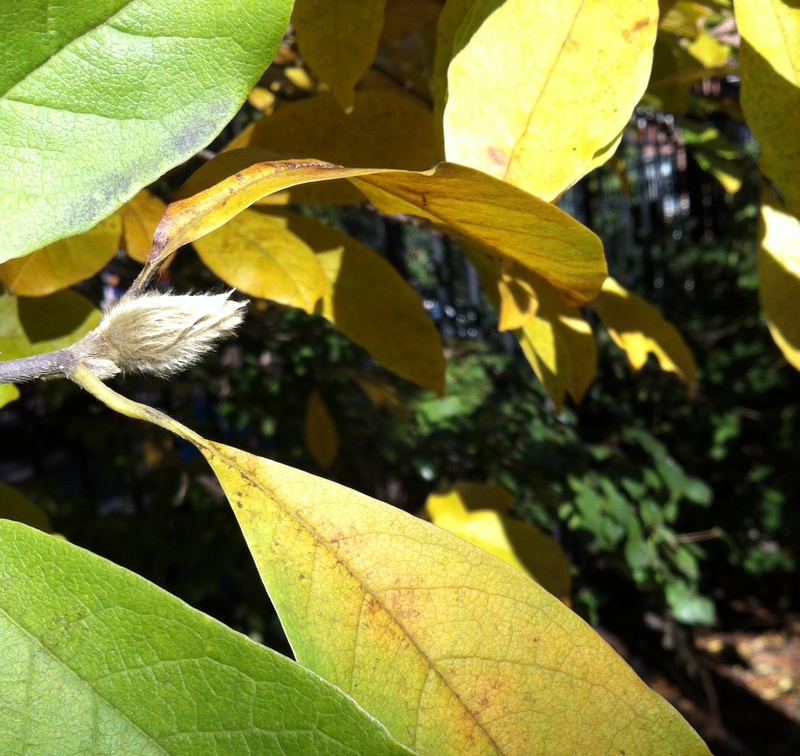 Check out the tulip tree allee at the New York Botanical Garden. Let's hope these WSP trees reach maturity! Walk towards the fountain then turn left (or west). There is a large Northern catalpa bursting with lime-yellow leaves growing just before you reach the Holley Monument. You have completed the tour given on November 14, 2014. Watch this space for an announcement of a spring tree walk. Wish I could have taken the tour in person, as the park is looking a lot "greener" than I remember it being in the 70's and 80's. Les, do you have any photos from that time? The park has lost a many large/mature trees in the last 5 years or so. 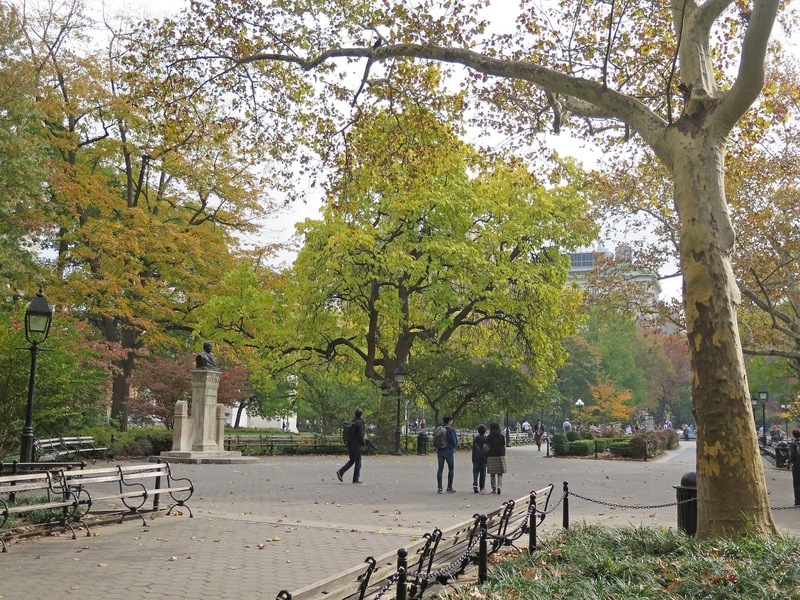 There has been a lot of changes since 1924 when the first decorated tree went up at Washington Square Park. Merry Christmas everyone!